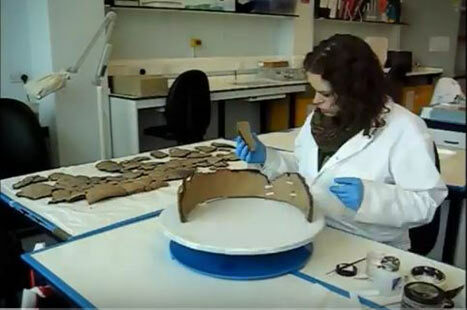 Gabrielle is a conservator with Wiltshire Council conservation and museum advisory council. Our October meeting at Melksham Assembly hall was presented by Gabrielle Flexer. Gabrielle is a conservator with Wiltshire Council, conservation and museum advisory council. Gabrielle gave a very interesting evening slide presentation of her work on some of the archaeological finds in Wiltshire, how they were cleaned and preserved, explaining some of the modern high tech methods of cleaning, examining with x-rays and conserving for the future. Gabrielle has the task of cleaning and identifying the 1,266 Roman coins that were unearthed in Malmesbury recently, dated from about 300 AD. Afterwards, Gabrielle answered questions from the 45 members and guests, before refreshments were served. The association's AGM will be held on Thursday 16th November. Tickets are available priced £5 from Viv Dwyer on 01225 704027. To include a Buffet supper. Entertainment by Pete Butler.